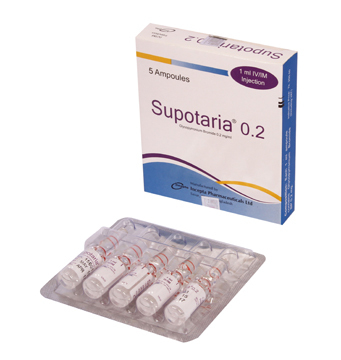 Supotaria 0.2 mg/ml Injection: Each 1 ml ampoule contains Glycopyrronium Bromide BP 0.2 mg.
Supotaria 0.6 mg/3 ml Injection: Each 3 ml ampoule contains Glycopyrronium Bromide BP 0.6 mg.
inhibition of micturition and reduction in gastrointestinal tone; inhibition of gastric acid secretion. Quaternary ammonium compounds are sparingly lipid soluble and do not readily pass lipid membranes such as the blood-brain barrier. Central effects are negligible. • As a pre-operative antimuscarinic agent to reduce salivary, tracheobronchial and pharyngeal sections and to reduce the acidity of the gastric contents. • As a pre-operative or intra-operative antimuscarinic to attenuate or prevent intra-operative bradycardia with the use of suxamethonium or due to cardiac vagal reflexes. • To protect against the peripheral muscarinic actions of anticholinesterases such as neostigmine and pyridostigmine, used to reverse residual neuromuscular blockade produced by non- depolarizing muscle relaxants. Adults - 0.2 mg to 0.4 mg intravenously or intramuscularly before the induction of anesthesia. Alternatively, a dose of 0.004 to 0.005 mg/kg up to a maximum of 0.4 mg may be used. Larger doses may result in profound and prolonged antisialogogue effect, which may be unpleasant for the patient. Children - 1 month to 12 years of age 0.004 to 0.008 mg/kg up to a maximum of 0.2 mg intravenously or intramuscularly before the induction of anesthesia. Larger doses may result in profound and prolonged antisialogogue effect which may be unpleasant for the patient. When used to treat arrhythmias associated with traction reflexes, the usual attempts should be made to determine the aetiology of the arrhythmia and the surgical or anesthetic manipulations necessary to correct parasympathetic imbalance should be performed. Adults - In those situations where intraoperative use is indicated, a single dose of 0.2 to 0.4 mg (or 0.004 to 0.005 mg/kg up to a maximum of 0.4 mg) by intravenous injection should be used. This dose may be repeated if necessary. Children (1 month to 12 years of age) – In those situations where intraoperative use is indicated, a single dose of 0.004 to 0.008 mg/kg or up to a maximum of 0.2 mg by intravenous injection should be used. This dose may be repeated if necessary. stability results from this method of administration. Children (1 month to 12 years of age) - 0.01 mg/kg intravenously with 0.05 mg/kg neostigmine or the equivalent dose of pyridostigmine. Supotaria may be administered simultaneously from the same syringe with the anticholinesterase; greater cardiovascular stability results from this method of administration. accommodation, photophobia, dry mouth, flushing and dryness of the skin. Side effects that occur occasionally include confusion (particularly in the elderly), nausea, vomiting and giddiness. Cardiovascular: Tachycardia, ventricular fibrillation, bradycardia, palpitation and arrhythmia, hypertension, hypotension, cardiac arrest, heart block, prolonged QTc interval. Dermatological: Flushing and inhibition of sweating, severe allergic reactions or drug idiosyncrasies including urticaria and other dermal manifestations, pruritus, dry skin. Gastrointestinal: Nausea, vomiting, dry mouth, constipation, taste alterations, including loss of taste. Genitourinary: Urinary hesitancy and retention, impotence. Ocular: Blurred vision due to mydriasis, cycloplegia, photophobia, increased ocular tension. Nervous System: Inhibition of transmission at neuromuscular junction, headache, nervousness, drowsiness, dizziness, seizure, insomnia, some degree of mental confusion, especially in the elderly, hyperexcitability in children. Pregnancy and perinatal: Suppression of lactation. General: Hyperpyrexia bloated feeling, anaphylaxis/anaphylactoid reaction, and hypersensitivity. Injection site reactions including pruritus, oedema, erythema, pain have been reported rarely. Antimuscarinics should be used with caution (due to increased risk of side effects) in Down’s syndrome, in children and in the elderly. plate nicotinic receptors. This should be considered before using glycopyrronium bromide in patients with myasthenia gravis. It is known that the administration of anticholinergic agents during inhalation anesthesia can result in ventricular arrhythmias. adults. Infants, patients with Down's syndrome and pediatric patients with spastic paralysis or brain damage may experience an increased response to anticholinergics, thus increasing the potential for side effects. A paradoxical reaction characterized by hyperexcitability may occur in pediatric patients taking large doses of anticholinergics including glycopyrronium bromide. Infants and young children are especially susceptible to the toxic effects of anticholinergics. Safety and effectiveness of long-term IV use has not been established in pediatric patients. 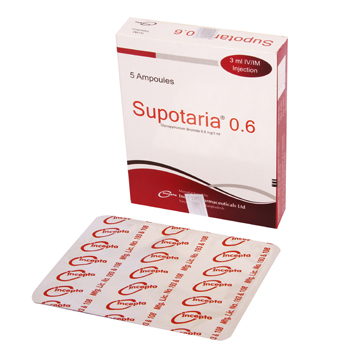 Long-term use of Supotaria is therefore not recommended in pediatric patients. Clinical studies of glycopyrronium bromide did not include sufficient numbers of subjects aged 65 years and over to determine whether they respond differently from younger subjects. Other reported clinical experience has not identified differences in responses between elderly and younger patients. In general, dose selection for an elderly patient should be cautious, usually starting at the low end of the dosing range, reflecting greater frequency of decreased hepatic, renal or cardiac function and of concomitant disease or drug therapy. Data on the use of glycopyrronium bromide in pregnant women, other than on delivery, are not forthcoming, nor is there documentation concerning excretion in breast milk. Although glycopyrronium bromide does not readily cross the placenta, the injection should only be prescribed to pregnant women when clearly necessary. Caution is advised when considering administration to a lactating mother.